Instructions: Create a card base from white card stock measuring 41/4" x 51/2". Trim out premade card panel shown in sample, as well as a red decorative background mat measuring just slightly smaller than the card base from the O Holy Night Paper Collection. Using manual die cutting machine, along with the rectangle die from the Cut Mat Create 1B Die that coordinates to the center rectangle on the premade card panel, die cut out center image portion. Ink edges of die cut, outer portion of premade card panel, as well as background mat using Ranger Archival Ink - Vermillion. Adhere background mat, and premade card panel background to card front as shown. Using Ranger Archival Ink - Jet Black, stamp Season's Greetings sentiment onto center of die cut rectangle. Apply pop dots to back of sentiment panel and then adhere to card front at an angle as shown on card sample. Stamp two inkings of the Sparkling Poinsettia Cling Stamp Set, one inking of the small wedding bell image from the Classic Wedding Bells Cling Stamp Set, two inkings of the pinecone image from the Silent Night Scroll Cling Stamp Set, as well as one inking of the large holly clusters from the Poinsettia and Holly Clusters Cling Stamp Set all onto white card stock using Ranger Archival Ink - Jet Black. Begin coloring poinsettias using Ranger Archival Ink - Buttercup and Stack and Store Daubers, adding a hint of yellow ink to poinsettia centers. Color poinsettia petals using a combination of Ranger Archival Ink - Vermillion and Carnation Red. Die cut using coordinating dies. 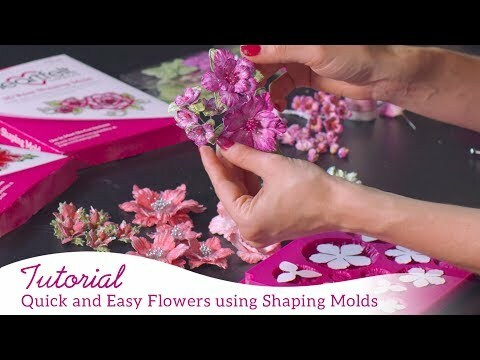 Shape using Deluxe Flower Shaping Kit. Create two double blossoms pairing one mid sized petal piece and a smaller petal piece, as well as one blossom pairing two smaller petal pieces. Using dries clear glue, adhere Go Man Go Prills to poinsettia centers. Set aside to dry. Next, color pinecone images using Ranger Archival Ink - Sepia, Coffee, Leaf Green and Fern Green using Stack and Store Daubers. Die cut using coordinating die. Color holly clusters using Archival Ink - Leaf Green and Fern Green using Stack and Store Daubers. Die cut using coordinating die. Shape pinecone images slightly using Deluxe Flower Shaping Kit, and holly clusters using 3D Poinsettia Shaping Mold. Color wedding bells using Memento Dye Ink - Peanut Brittle and Ranger Archival Ink - Buttercup, and ribbons on bells using Archival Ink - Vermillion and Carnation Red. Die cut using coordinating die. Snip apart the portion of the wedding bells die cut you wish to use on the card front as shown. Adhere bells image to card front as shown using pop dots using dries clear glue. Adhere poinsettia blossoms as shown. Lastly, add one pinecone image behind poinsettia on top of card front, and one pinecone image to the poinsettia cluster on bottom of card front. Add in holly clusters around both poinsettias as desired. Using dries clear glue and fine metal tip, adhere Crystal Transparent Glitter to bells and preprinted images on sentiment panel, and Rajni Chawla's Frosting Powder to poinsettia petals, pinecone images and holly clusters. Lastly, drop small groupings of Nuvo Drops to sentiment panel and lay flat to dry.